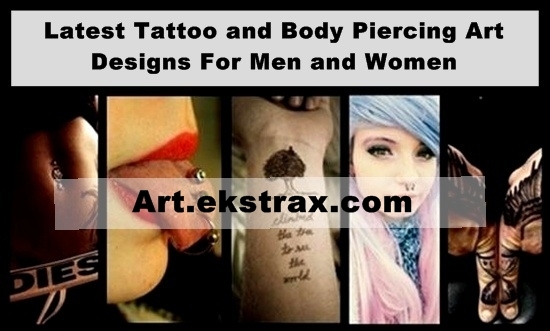 In this time, the exclusive question among the fashion lovers is about the Latest Tattoo and Body Piercing Art Designs For Men and Women: 2013 Edition. Because, every fashion lover wants to match steps with the latest going fashion. With tattooing and body piercing becoming a happening trend people may believe that this is a current trend, but the fact is it is an ancient practice. People have been decorating their bodies with tattooing and body piercing from a long time. Sometimes merely as a means of decorating oneself or sometimes as part of rituals and customs. However the piercing of body parts though practiced in a limited way in certain parts of the world is a recent rage. Now piercing can be seen in the common areas like different parts of the ear, the nose and other associated parts, tongue, cheeks, eyebrow and the lip area. Some have taken it to extremes and have gone for piercings on their genitalia. The opinion of such piercing is very confusing; some believe that it enhances pleasure and some believe that it is a means of giving very severe pain which somehow enhances pleasure. We also have people piercing along the spinal cord, on the breasts and at other areas. When asked many reply it is because of their sheer fascination with the process. But no matter what the reason for body piercings, one cannot help gawk at some of the places that people have gotten their bodies pierced. While you are going for body piercing do consider the long term effects of this on your life. Also consider that this sort of body decoration needs your investment in terms of time and care.